A British businessman who travelled to France to pay his respects to a fallen World War One soldier told how he got home from his trip and found an Ethiopian illegal immigrant hiding in the boot of his car. 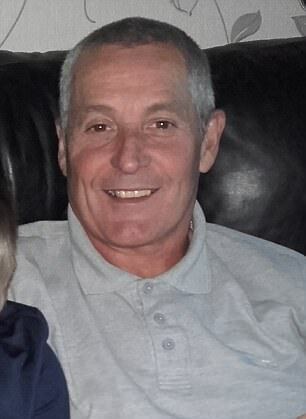 Construction company boss Paul Edmunds, 59, had made the journey to the Continent with wife Jan, 57, and their friends, Duncan Bennett, also 59, and his wife Kate, 55, to see the grave of Kate’s great uncle in Arras in northern France. 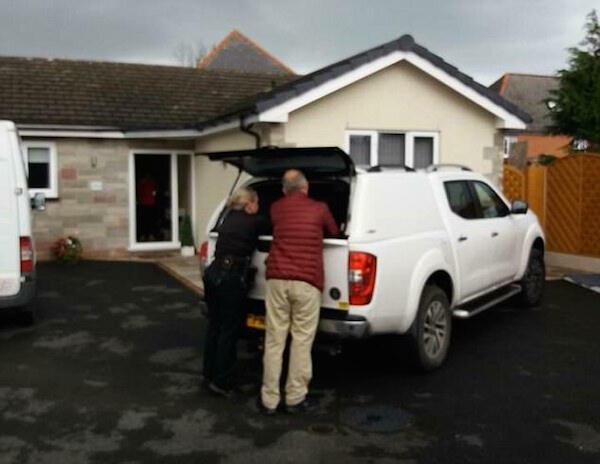 But when the group returned to their home town, Caersws in mid Wales, as they were unpacking the boot of Mr Edmunds’ Nissan pick-up, they spotted a man’s trainers poking out from among their bags. 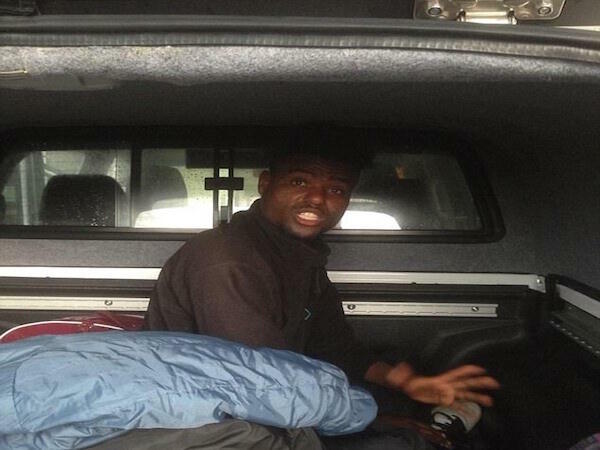 The stowaway turned out to be a 22-year-old Ethiopian who had climbed in to the back of the vehicle, probably while Mr Edmunds took a quick nap at Calais after passing through customs prior to the journey home. When the Ethiopian found out he was in Wales he made a prayer gesture and smiled. He made a prayer gesture and smiled.’ Mr Edmunds believes the man must have crept in to his vehicle as the group waited to board the Eurotunnel shuttle back to Britain. ‘I needed a nap so we parked up and the other three went for a cup of coffee while I slept in the driver’s seat. I’d left the car unlocked while I slept. Mr Edmunds said he spotted the man as he unpacked his Nissan Navara at home following a 4½ hour drive from Folkestone. ‘He didn’t speak English but was able to ask if he was in England. I said ‘Yes — well Wales actually’ and he made a prayer sign and smiled. He said the illegal immigrant had a phone and was trying to contact someone in England. The four British friends had been on a four-day trip in France before boarding the shuttle in Calais. Lorry drivers face fines if stowaway migrants are found but holidaymakers do not. On seeing the immigrant, Mr Edmunds called police and the 22-year-old was handed over to immigration officials. He said cops arrived at their home within 15 minutes of his 999 call. The Home Office has said that the man will be dealt with according to immigration rules. Mr Edmunds said: ‘I asked him again where he was from and he said “Africa”. He had a phone and was trying to contact someone here. ‘I’ve never seen my wife’s mouth open so wide as when she saw him step out of the boot.’ The man was arrested and handed to immigration officials. In 2015, the Channel Tunnel terminal in Coquelles, near Calais became a flashpoint as migrants attempted to charge onto the site to board trains and lorries.